I just had a most fun weekend with my high school friends for an all-class reunion. It has been more years that I want to count, but it seems we always pick up where we left off, and we always love getting together! Since I’m still a “local”, I love opening up the house to my out of town friends. I was bestowed with some very creative and lovely gifts and want to share some pictures, because I thought that if you are like me, then you are always looking for ideas for great gifts! These ladies came up with some fantastic and thoughtful ones that you could tailor to your own lucky recipient! 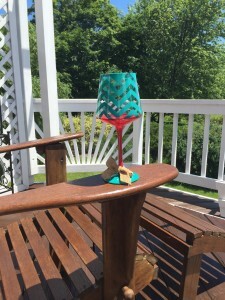 Windsocks and garden flags are colorful and cute, and they have a hidden benefit!!! I love this windsock. I hung it out off the deck railing right away to signal that the party had begun, and not only is it colorful and cute, but after a couple of days we realized it had a hidden benefit! I have a wide deck railing that the birds like to perch on, and every day I would need to wash it off due to the bird’s leaving something unwanted behind — if you know what I mean. 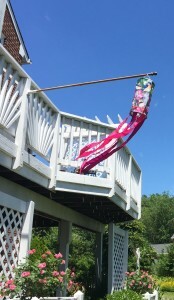 The motion of the windsock hanging so close to the rail kept them from perching there, or doing their “business” there. Yay! Hidden benefit!!!! Don’t worry though, there are plenty of close by spots for them to perch, and for us to enjoy them in the garden. 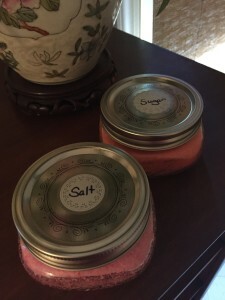 How wonderful to pamper yourself with a hand and foot scrub after a long day of gardening! Here’s another creative, pretty and very useful gift that any gardening lady or gent would love! These are specially-made hand and foot scrubs — sugar for your hands, and salt for your feet. There are many recipes to make these online and you can even color them with food dye to match the personality of your lucky recipient. And really, who doesn’t like to pamper themselves after a long day’s gardening? Perfect! Of course, these containers are just right, too! 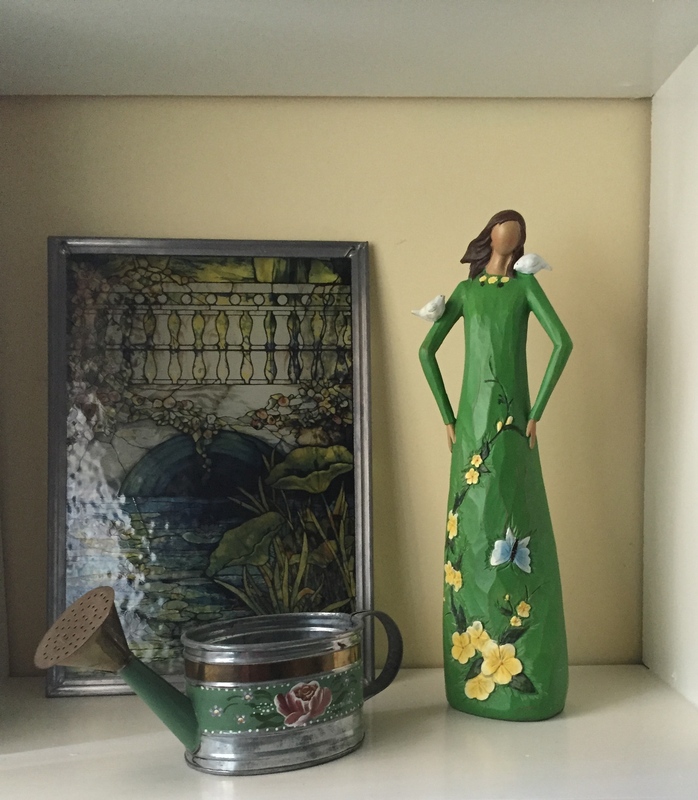 My Earthgirl statue, a hand-painted watering can, and a stained glass panel. Love them all! I thought this was truly fantastic: an Earthgirl statue bestowed on yours truly — I’m humbled! This was a very inventive gift for me, of course, but there are so many interesting statues out there, that I’m sure you could find the perfect one for your gardener as well! Also, I included a couple of other things I have received over the years in the photo. Watering cans are classic, fun and useful, and I’ve always loved this stained glass panel of Monet’s Waterlily garden. A bottle of wine is always enjoyed here with guests — and now I have a special glass, too! 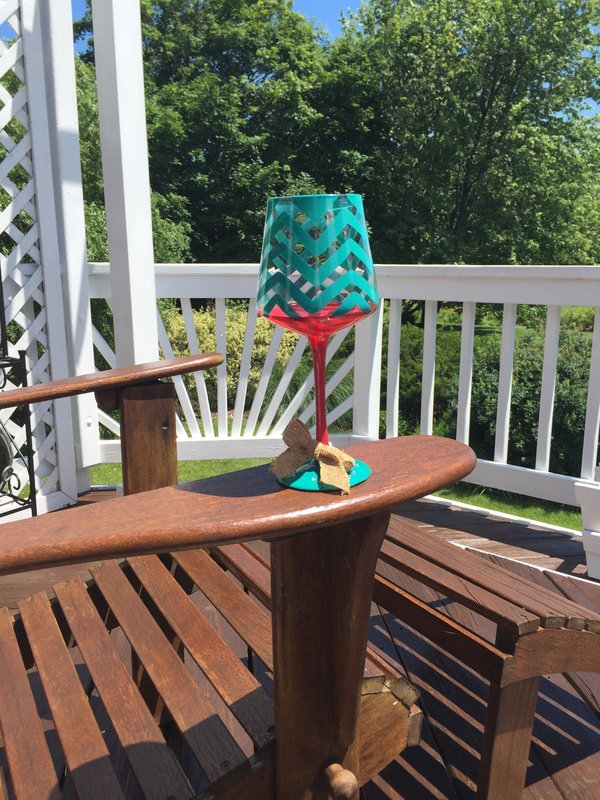 And last, but not least — what a perfect way to end the day: to sit back to view your garden, but with a glass of wine in a hand-painted wineglass! There was a different glass for each of us. How special is that?? I hope these imaginative ideas will help you to choose a great gift next time you are looking for one. Thank you again to my lovely house guests, I will treasure these always! And you shouldn’t have! A wall of rescued tile turned into Art. I don’t know about you, but I love to craft, and especially with recycled items. 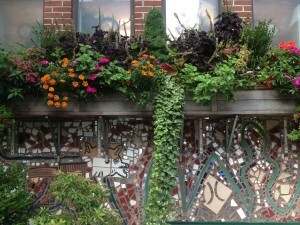 I have been on a recent trip to Philadelphia and while there went to an amazing place called the Magic Garden. It’s filled with mosaics covering pretty much everything. There are about 150 properties in and around the city with mosaics from this prolific artist and it really got my creative juices flowing. I definitely have a mosaic or two in my future — maybe a birdbath or a garden table. What a fun way to show your own personality in a garden! Made from worn out gardening tools, this chair is a definite for my garden. I like the idea of having useful items that double as Art. The internet is an amazing place for inspiration. I have become a huge fan of Pinterest for craft ideas. 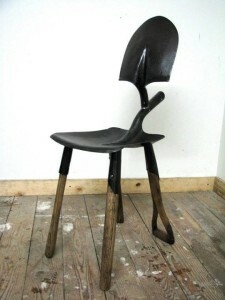 I think this chair from Pinterest is so terrific. Anything that I can make with rescued, or broken-beyond-repair things is high on my list! I love the ability to switch things around, so small projects, like a birdbath or a pretty flower pot with shells glued on, are fun to create and fill in gaps when the flowers are not in season. Great “Kid” project- rocks painted like candy. There are such cute things for every level and age of artist/gardener. 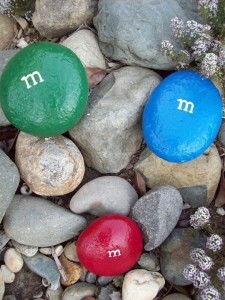 I saw these cute little rocks painted up like M&M’s, (again on Pinterest,) and thought what a great project for kids! It’s always nice to have some ideas that really can’t be done wrong to make even the most timid feel like an artist! These topiary forms are made with harvested vines and branches. 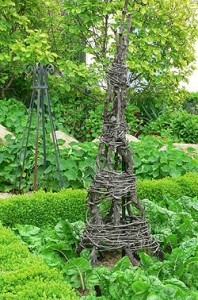 Another useful art project that I very much want to make are a few of these topiary forms, made with harvested vines and a few branches. The more natural the better in my garden! I love creating ivy topiaries, but you can grow any number of things on them — small gourds, cucumbers, clematis — sky’s the limit! 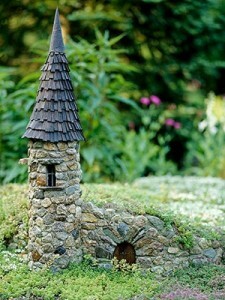 Made with small stones, what a fun Fairy house! For those who like to attract garden fairies into your life, how about a charming little dwelling on the side of a garden path? I think I’d take it one step further and disguise a light inside to mark the edge of the pathway at night. Tin man made from old cans. Add a hose, and he becomes a built in helper! It seems there are so many great ways to recycle cans these days. I love this tin man! 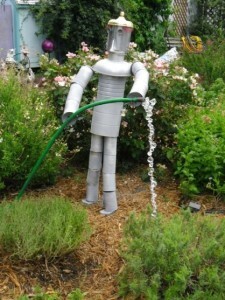 And if he can help with the watering, then I’d really like to have him in my garden! So much inspiration, and I’d love to credit to the creative people who made these items, but it’s impossible to trace the originator on photos that don’t have a watermark. These (except the top picture, which I took) are all from Pinterest. Well — I think I have enough winter projects to keep me busy for a long time. I love to recycle! What projects do you have in store?